I have joined in this week with the challenge over at "Less is More" the brief this week is Flowers. It's been a long while since I have joined in with a challenge. I don't often get the time. I have always loved kraft card. It comes in and goes out of fashion but for me It will always a favourite card stock of mine. I don't use it often enough, cos not every one likes it. So when I get an excuse to use it I jump right in. Well that's all for this post. I hope you like the card. Thank you for stopping by....... I will see you again soon with another creation soon. 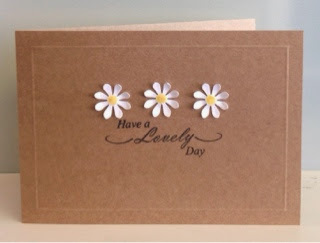 Like the simply elegance of three daisies, beautiful card! Sue, I love kraft paper too and your card has inspired me to pull mine out again! Beautiful daisies! Such a lovely, sweet card! 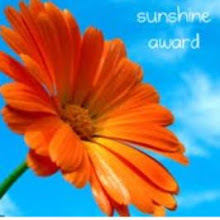 This looks lovely, daisies are one of my favourite flowers! We would be really grateful if you could remove the Word Verification from your blog thanks so much! Brilliant and stylish CAS card. Simply fabulous. Love daisies and you`ve used them beautifully. Glad you could join us with this pretty card Sue! Your card caught my eye in the LIM gallery - what a pretty card! The daisies look great against the kraft background.